Up in the capital yesterday, 9 men S-Pulse pulled a mini miracle out of the hat. At 9 v 11 away from home with 15 minutes still ahead of us, nobody would have dared dream of getting a result. 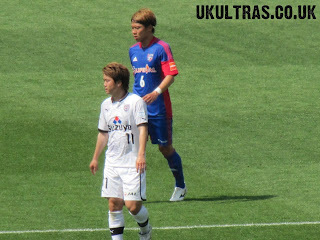 Step up super sub ex-Tokyo Verdy Toshiyuki Takagi. Ten minutes after coming on he smashed it unstoppably past Gonda to send a disbelieving away end into an explosion of orange ecstasy. 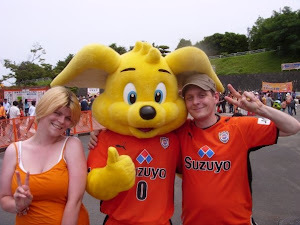 Had the pleasure of bumping into a couple of Brisbane Roar fans after the game over for the ACL match on Wednesday with Tokyo. Will save you fellas a couple of seats on Thursday if you're coming down! Highlights. The second yellow for Franca was really harsh if you ask me. He jumped, using arms to gain hight. That his hand (not his arm, not his elbow) brushed the Tokyo player's face was unlucky at worst. To give a second yellow is a very clumsy decision by the ref. It was repeated later for the second yellow for Brosque though, so Nishimura is clearly a man with control issues. Toshiyuki's belter is everything as good as I remember and sent us delirious. Nearly broke the net with that one. 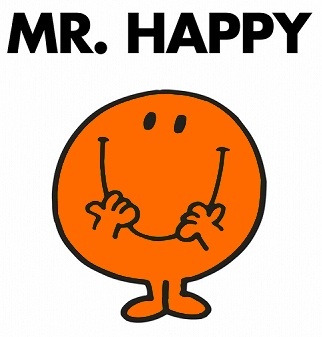 All credit to Taka who dinked in a perfect little ball in between the two defenders. Our keeper Akihiro Hayashi's excellent start to his S-Pulse career has not gone unnoticed, and he is currently part of a 23 man national team training camp in Chiba. 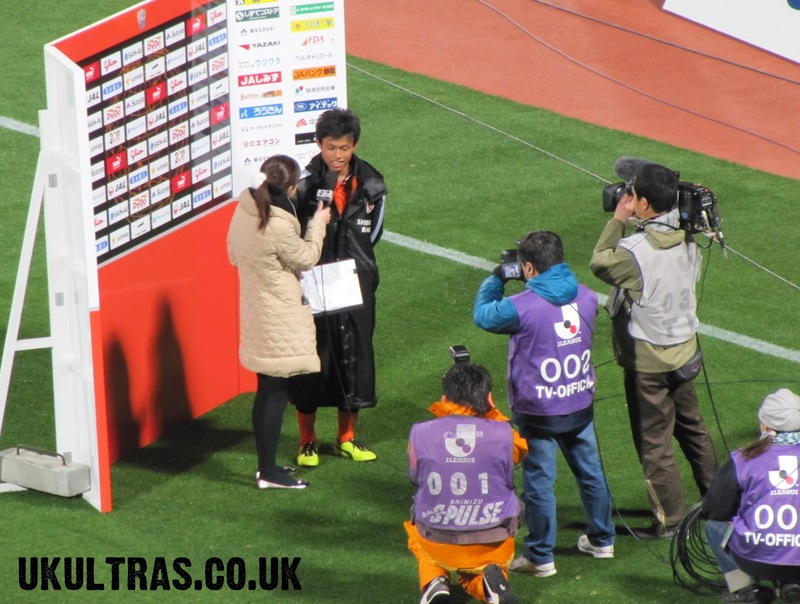 His call up is no small achievement, having only returned to Japan in February, but anyone who has watched us this year will know he's a fantastic prospect. The 195cm 24 year old has represented Japan U23, and this three day camp is a real chance at staking is claim to a full national team call up. Click here for the full list of members, in Japanese but with the player names at least in English. A crap result. The home side thoroughly deserved their three points. A game to learn from, then forget. Takahara had a header cleared of the line early on, and Gamba's second came from a saved penalty which Rafinha was the first to reach, so with a little luck it may have gone a different way. But it didn't. And the longer the game went on the less and less we looked like scoring. Very few chances created, with the late consolation coming after a free kick which Osaka couldn't clear. May write more if I get time after work tomorrow, but got stuff to do right now. Show Your Support - Join the 20th Anniversary Mosaic! 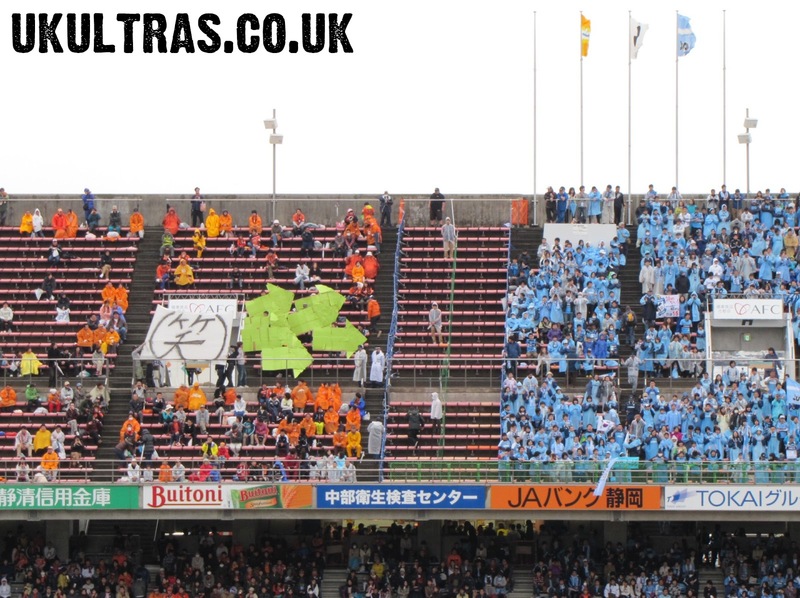 S-Pulse are currently putting together a vast mosaic to be unveiled at Nihondaira for the Kawasaki Frontale match, July 7th. Our first ever game was July 4th 1992, so this is planned to be centrepiece of our 20th anniversary celebrations. 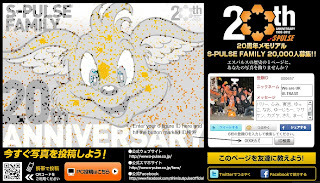 The theme is S-Pulse Family, and is intended to reflect our huge spectrum of supporters. I've got my picture on there, so what are you waiting for? 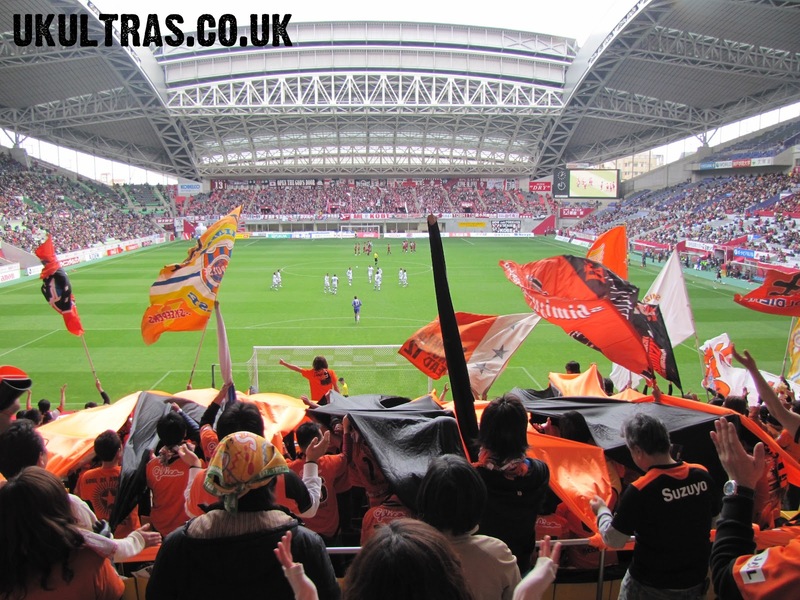 Let's show the club the face of Shimizu fans around the world! 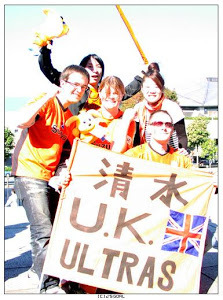 The official site only has Japanese support, which isn't much use to orange maniacs on foreign shores who don't read kanji. Well that's what we're here for, right? Follow the directions below and you too can be a part of it all. Fill it in as directed and hit submit. On the next confirmation screen they'll be two big buttons. Click the one on the right, and it's job done. There is no limit to the number you can send in. Put your six digit ID in the box and hit the button next to it. You'll then see your smiling face captured for all time among thousands of other S-Pulse fans. Simple. Be aware that they check each picture for suitability so may take a little while for yours to show up. Mine took two days. The deadline is June 3rd! Don't hang around or you may end up disappointed! 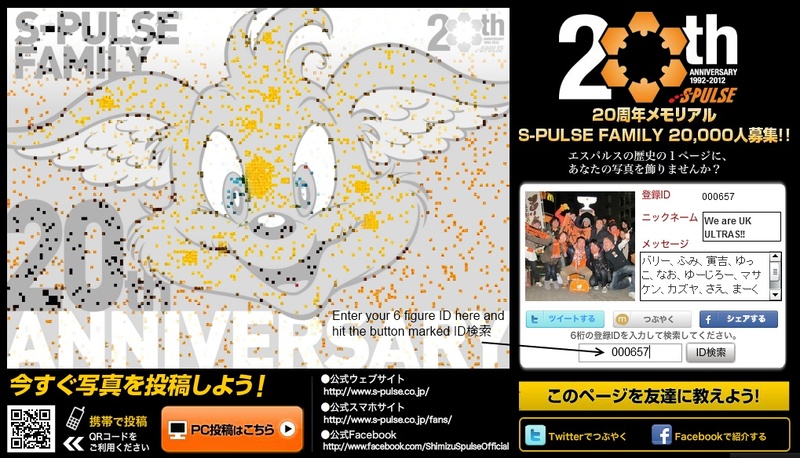 Even if you're overseas, if you're an S-Pulse fan you can still make your mark on our 20th anniversary celebrations. A deserved win against a resilient but ultimately toothless Yokohama side who are left still searching for a first win of the season. The first half was pretty balanced, but with us creating the more concrete chances. 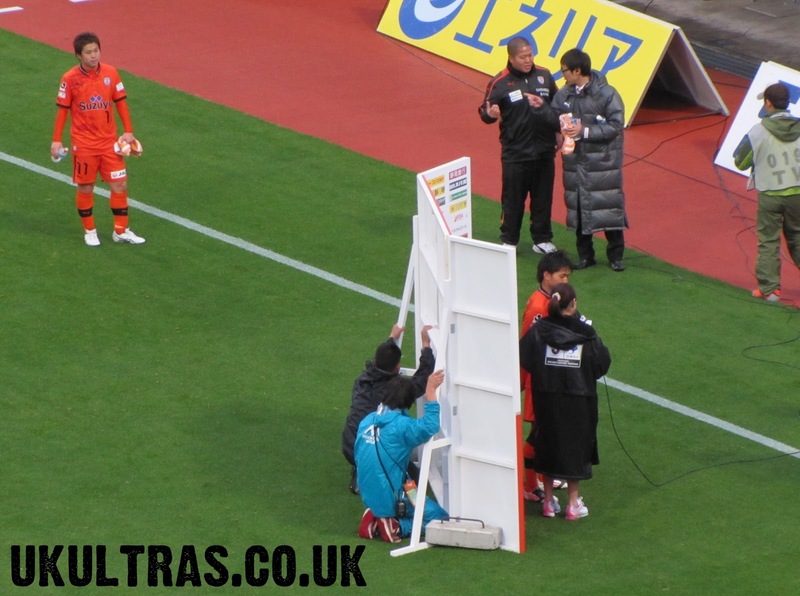 Hiraoka picked up a knock to his shoulder at the end of the half which saw Iwashita, back from injury, return to partner Jong a Pin at the back. The second half we took to the visitors for long spells, and were lacking the rub of the green on a couple of occasions. Our pressure finally paid off with a flick of sheer class from our man of the match (surely) Alex Brosque. He covered the entire pitch, was a rock in the centre of the park, and most of what we created went through him. A very good performance, but not a one off by any means. He's become one of our most important midfielders over the last few months. 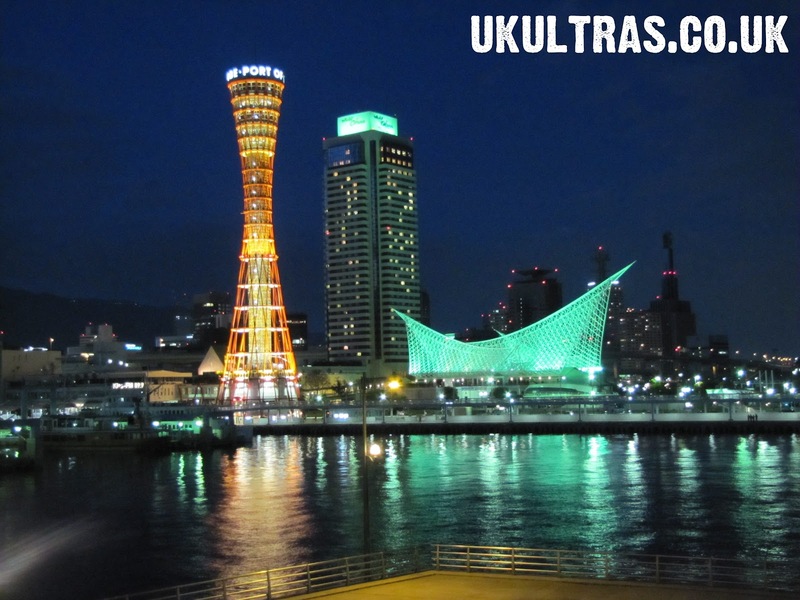 The win puts us second behind Kashima in Group B, but with a game less played. Highlights. With thanks to Amir for posting these so speedily on Twitter! That makes it now nine years unbeaten at home in the derby, but our first home derby win since 2009, so boy did we enjoy it. Took a little while, though. Awful slippery conditions, granted, but we started pretty wretchedly and were second best for most of the first half. 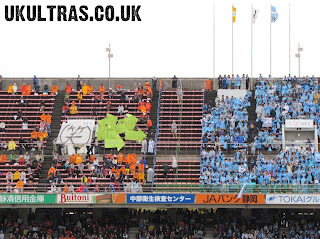 Jubilo played a primary school esque swarm style of football, and in the wet conditions which made long passing a treacherous business, closing down our players with three blue shirts every time paid off for them. Yoshida's early substitution for Kawai made a big impact on the game, and it transpires his ankle was giving him problems. This made things hard work and his game was suffering. Kawai, who has just signed a full Pro A contract, slotted into right back and was commanding throughout. Speaking of defences, we should call Jong a Pin The Wall. Nothing got past him all game, and if he's not one of the top defenders in the country then I don't know who is. Instrumental in our back four, which was missing Iwashita through injury. So after the injured Yoshida was replaced, things improved and culminated in our equaliser from a bullet header from Takagi. Toshiyuki lost his marker (was there even one to begin with?) and slammed it home. Jubilo had taken the lead from a corner which was pretty poorly defended by ourselves to be fair, but that was their only effort all half, despite our struggling. The second 45 was a different story, and our stall was set out right away. Just three minutes in, a pin point cross from Takagi was met by a stampeding Genki who, completely, totally, 100% free, had all the time in the world to meet the ball perfectly and slam it in the back of the net. The stadium erupted. Only after we were leading did we introduce Ono and Takahara, and it's crucial that we can control and lead a game without these two important players. 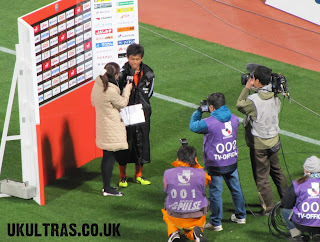 Genki had been waiting for his first goal and that lifted some pressure off. Not just for him, but that goal really seemed to settle us, and we played a much more relaxed game in the second half. Takahara came on for the last ten minutes and was giving Jubilo all kinds of problems. He got a decent shot in at one point and at was the man to lay the ball off to Genki who beat three defenders and poked the ball past the keeper while falling over. A goal of quality. But for a late consolation from the visitors, it was game over and despite the rain and cold, Nihondaira was rocking to the awesome sound of another derby victory. When it all comes together, nowhere in the country is like it. Omae's goals in super slow motion. Tell you what, watching this happen live right in front of you was bloody GOLDEN. Check out a great interview with our boss on FIFA.com here! Well we all know what tomorrow is, don't we. :) But before that, this. August 22nd 2009. 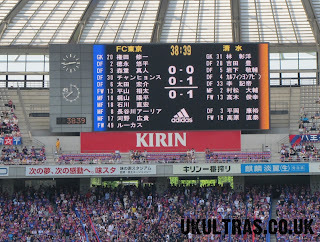 The biggest victory in Shizuoka Derby history. It was my absolute privilege to have been in the thick of it behind the goal. 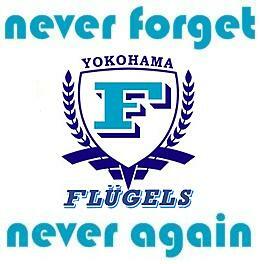 If that doesn't get you in the mood you're either dead or a jubilo fan. 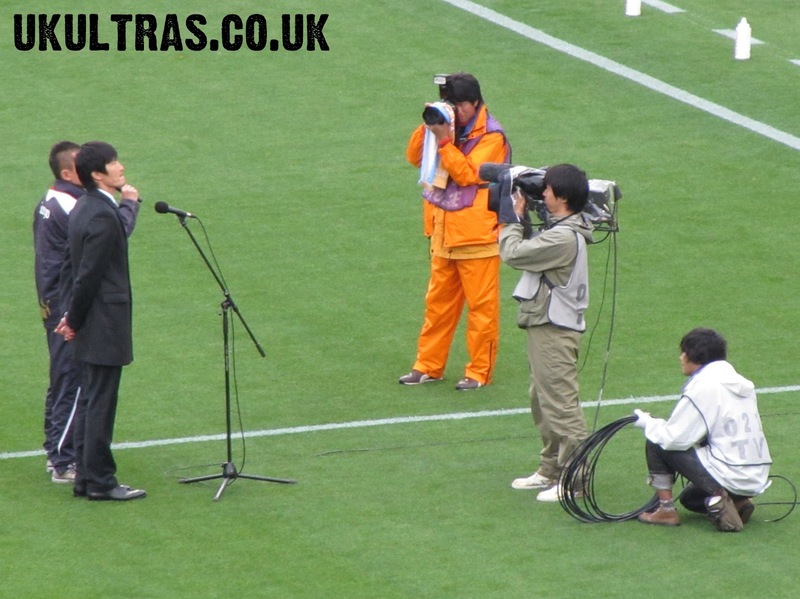 This Saturday we'll be having S-Pulse old boy, and not to mention derby hero, Cho Jae-Jin dropping by. 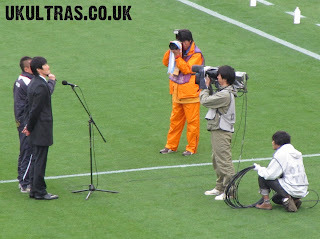 The former Korean international spent four years with us from 2004 and bagged 45 goals in orange. Not least this timely little beauty in 2007. 93:53. By far the most mental I've gone at ANY derby since I've been in Japan. 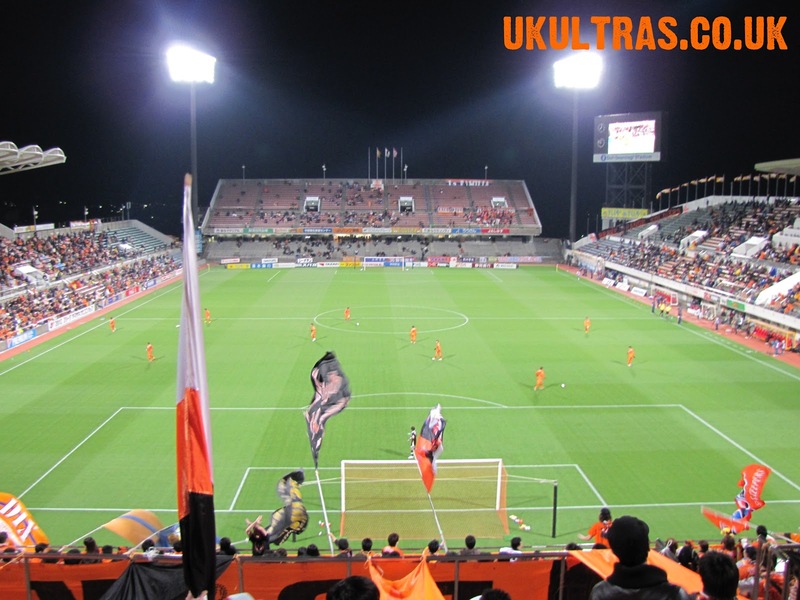 Not to mention the two he put in at a packed Nihondaira earlier in the year to beat the scum 2-1. The man is a modern derby legend, and it'll be great to welcome him back. OK, so I know it isn't the all conquering QUEENS of Japanese idol groups, but what are you gonna do? On Saturday, due on pitch an hour before kick off, are the new kids on the block, Nogizaka46. 16 of the 46 strong collective will be performing a show to help warm our cockles on what's looking like a third rainy day out of three so far this year. The 16 include Mai Fukuzawa, who hails (poor girl), from Iwata of all places, and Yumi Wakatsuki, from 20 minutes down the road in the S-Pulse stronghold of Fuji. Expect fireworks between the two! Maybe. Nogizaka46 may be the official rivals to J. Pop royalty AKB48, but they're gonna have to go some yet to claim that flowery crown. A hard fought, and thoroughly earned, first away win since last July. 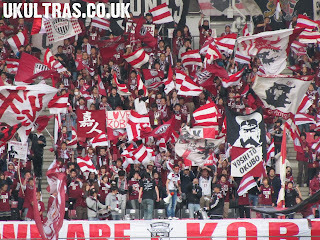 Vissel were the more dangerous from the kick off, but our defence is looking increasingly stingy as the season goes on, and so it was on Saturday. After last year's unpleasantness which led to Jong a Pin's untimely exit, he responded in the best possible way with a commanding performance at centre back. Many eyes were on new singing Jymmy Franca's first start in Orange, spearheading the attack. It was always going to take some time, and the big man is clearly acclimatising to J. league football. He didn't stop running and his effort doesn't go unnoticed by the fans. He was also unlucky not to have chalked up his first goal, and from what I hear the goal he dispatched one on one past Tokushige was not offside. Yet to see it though, so no comment from me. It was a clinical finish with the keeper making every effort to close him down and make the save, so will only help his confidence, despite it not standing. The first half was solid defensively, but in what was a more frantic second half the introduction of Kobayashi and Edamura helped us set the pace more in the centre of the park. Edamura was going for everything, and it was his putting pressure on S-Pulse old boy Kazumichi Takagi which caused the defender to spill the ball in the danger zone. Brosque knocked it through to the advanced Eda, and while the keeper got down well he couldn't hold on it. The Australian was on hand to put it home in front of us lot who, after a quick check of the linesman, went accordingly berserk (including the lads behind me who had been belting out S-Pulse songs all game in broad Kansai accents). Special mention must go to Muramatsu who started the whole move with his strong physical presence on the ball - check it out in the video below. 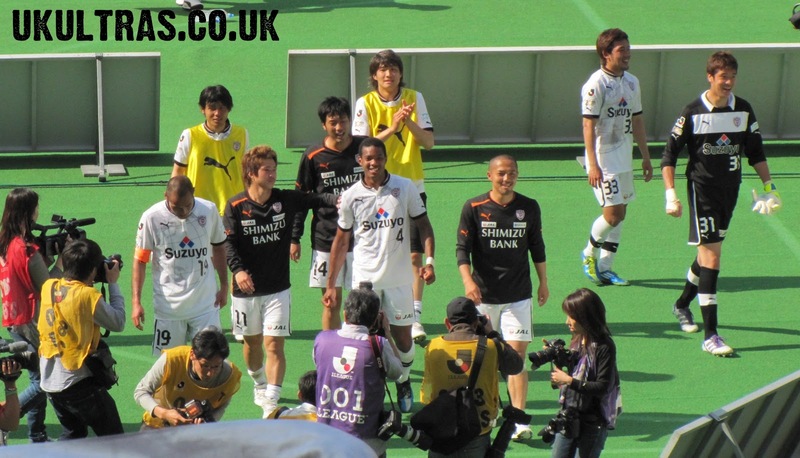 Another clean sheet, a third win in eight days, the sun is shining and the cherry blossoms are in bloom. 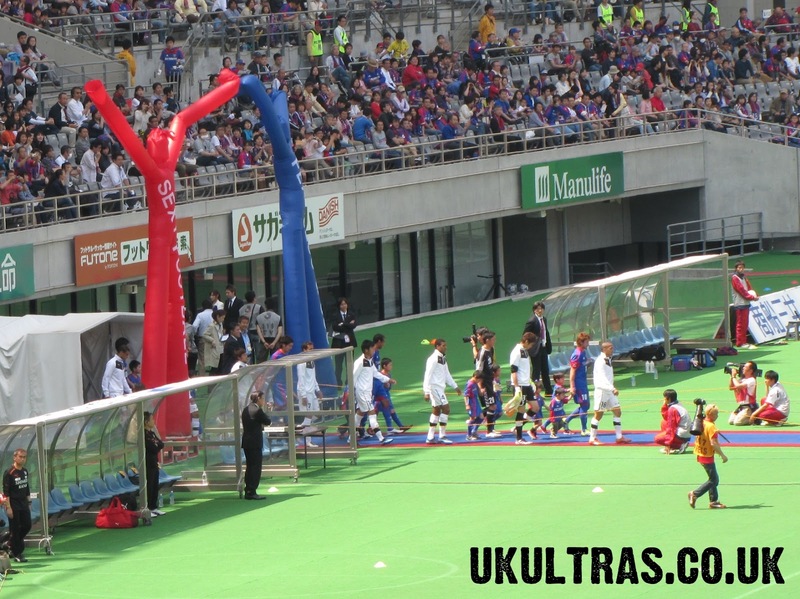 Things are hitting pace just in time for the big one this Saturday: the Shizuoka Derby. We've not done them at home since the 5-1, so it's about time we got a result. 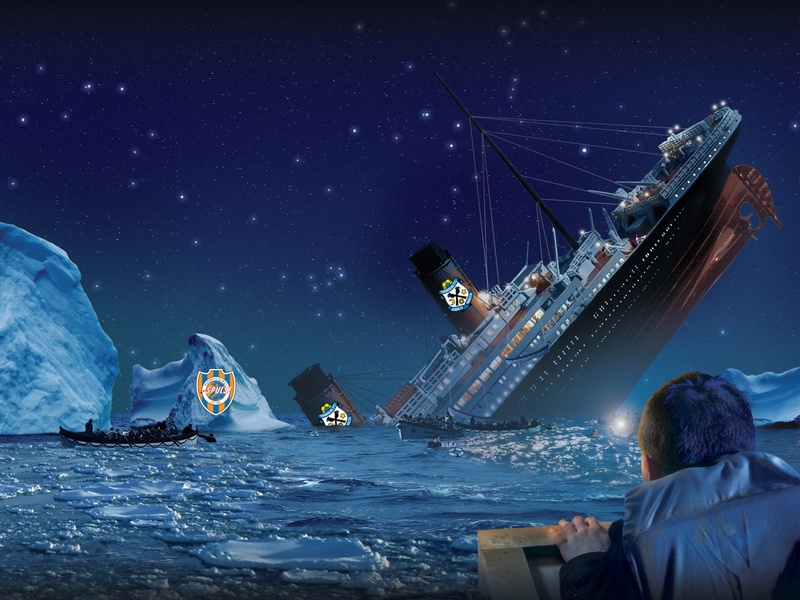 It's also well overdue that the wheels come off their uncharacteristically good start to the season. 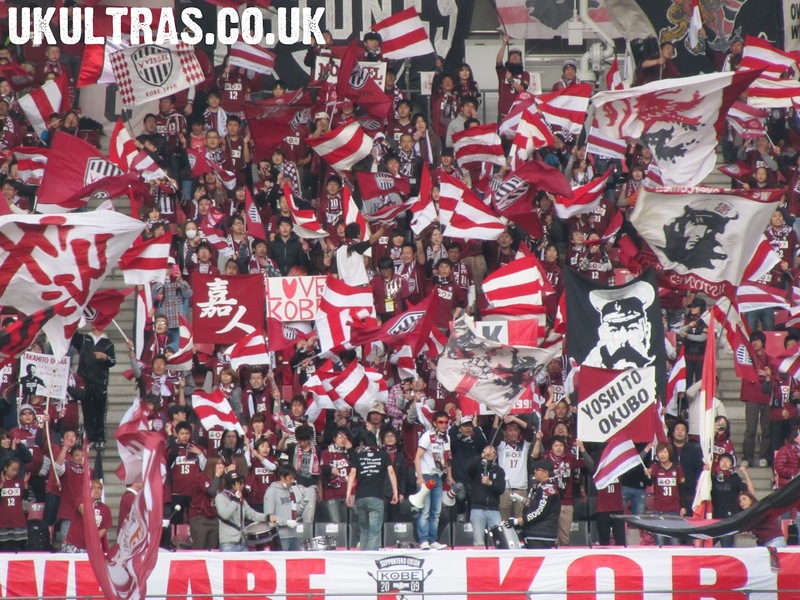 Watching them concede a 95th minute equaliser up at Sendai is enjoyable sure enough, and must have been gutting for their small smattering of supporters, but it's a win on Saturday or nothing. Bring it on!! 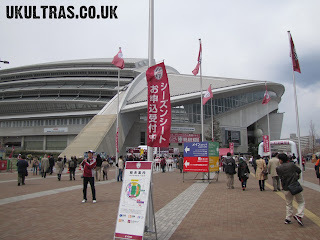 Best away day since Fukuoka! 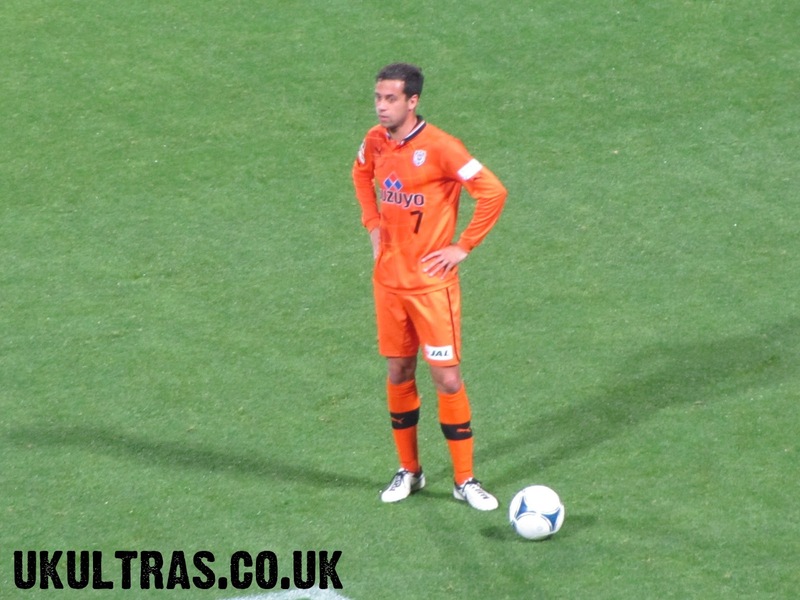 Ex-S-Pulse defender Naokai Aoyama had one of those moments last night. An entirely different team to the one that beat Sapporo, we had three débutantes, and several other first starts for this term. For what was an almost entirely new team line up, it was a great result. Niigata, a far older and more experienced starting 11 than ourselves, held their own level of threat, especially after they brought on Bruno Lopes, but Kaito was level to anything they could manage. 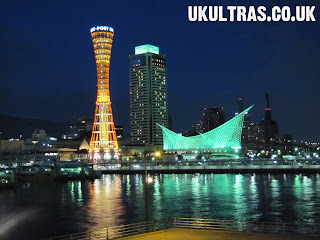 OK, so I'm running around trying to get ready for a weekend in Kobe, so it's going to have to be quick. Kaito had a good game, turning a point blank shot onto the post in the 89th minute. He was sharp, but Hayashi's catching of the ball was missed. Maybe it was down to his time in England, but Hayashi is great at catching rather than punching it away, and that does wonders for my nerves. Jong a Pin was massive and Niigata couldn't handle him at all. He was a calming influence on the young Inukai and Kawai (who started at side back). In midfield all eyes were on Ishige, and he showed great vision and reading of the game. He almost even scored late on but the keeper got down to his perfectly directed shot. Has he just belted it you can't help thinking it would have beaten the Niigata keeper, but he's not that sort of player. A great touch and given a few games he'll start to get a real feel of Nihondaira's field. Up front, Shirasaki made his home début and had a couple of decent attempts on goal, but again, he's still getting a feel of his home ground and finding his range. 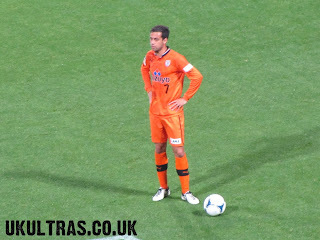 In fact, it was from miss kick of Shirasaki that the ball fell to the relative veteran Kobayashi who slotted home. Off to Kobe straight after work tomorrow until Sunday night, so no update until Monday, I'm afraid. You can follow us on Twitter @spulseukultras if you don't already, and I'll be tweeting from the ground and after the game as much I can get away with without getting into a row with the girlfriend. Kobayashi's goal from a personal video. 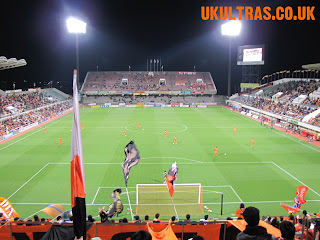 Tomorrow evening S-Pulse get their 2012 Nabisco Cup campaign started with a home game against Albirex Niigata. The format is the same as 2010 with stage one being two groups of seven teams. Each team plays six times, which means every team gets one match day off. If you check the table, you can see we've already had ours. 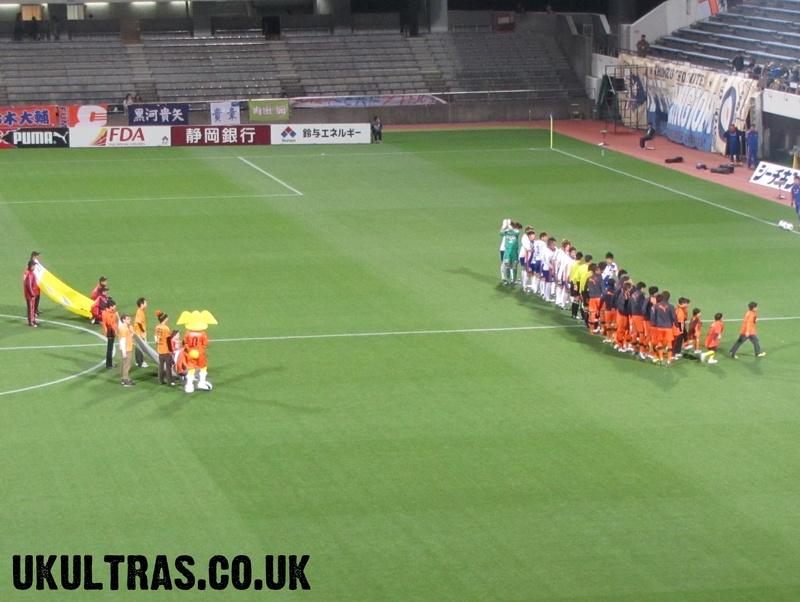 Expect to see a young team with a début for 17 year old Ishige and a first start for 18 year old Shirasaki. 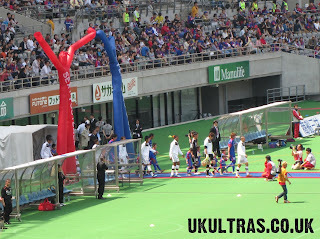 Kaito will be back in goal letting Hayashi rest up for Saturday's trip to Kobe. It'll be a great opportunity to see some of our young crop of players coming through and where the future of S-Pulse lies. 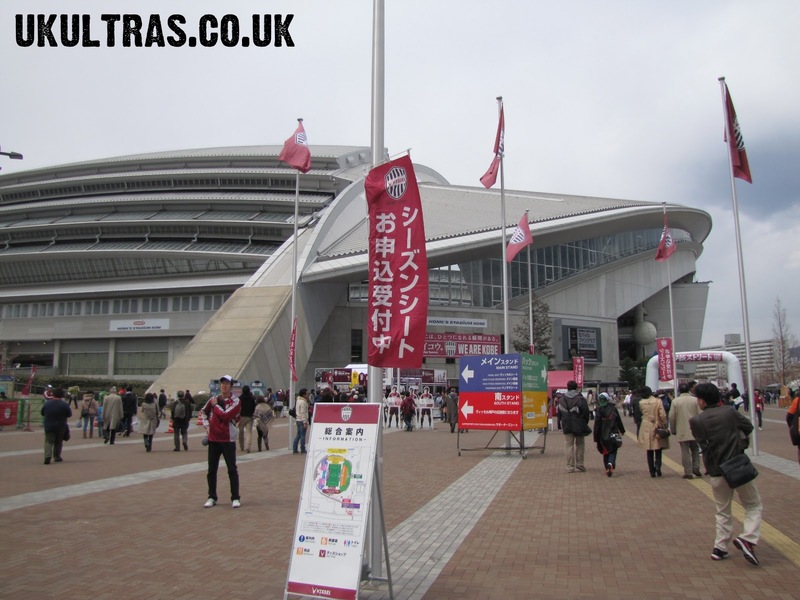 Niigata won their first game in the Nabisco Cup away at Consadole 1-0.